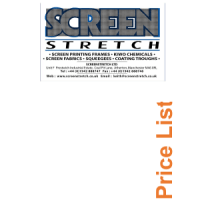 Our 2017 Screen Printing Supplies Price List / Catalogue is now available to download. If you are looking for something you can’t find in our catalogue or our website, please contact us and we will see if we can help! As one of the leading manufacturers of Aluminium and wood screen-printing frames at competitive prices you can be assured of a quality product.